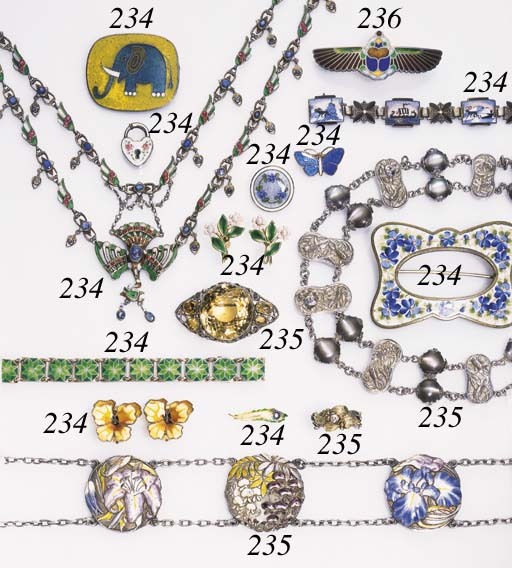 Comprising but not limited to brooches, bracelets, necklaces, etc; highlights include several enamel butterfly brooches mounted in silver; an enamel flower brooch; two bracelets, each of enamel geometric plaques, joined to oval links, mounted in silver--7 in., 7 ¼ in. ; a brooch, designed as a rectangular-shape enamel decorated plaque depicting floral motifs, mounted in silver; and a necklace, designed as geometric enamel decorated plaques, joined by oval links, mounted in silver--17 in. This lot has 20 pieces, not 19.